The climax of Party Poker´s PowerFest Series starts today with the $5 million guaranteed Super High Rollers Championship Event. If you don´t have a bankroll that can support the $25,500 buy-in, don´t worry. There are plenty more opportunities at Party Poker that could make this a weekend to remember. 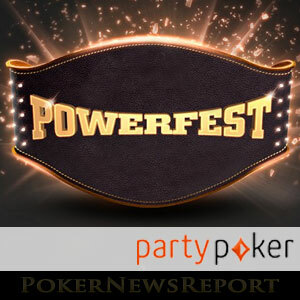 With ninety-nine events remaining in the PowerFest series – and more than $12 million in guaranteed prize pools – this weekend promises to be one of the biggest ever seen at Party Poker. Naturally, Sunday is going to be the main attraction due to three $1 million guaranteed Championship Events plus a very healthy supporting schedule, but there are plenty of opportunities before then as well. The big guns take centre stage tonight with a $1,050 buy-in High Rollers event and the $5 million guaranteed Super High Rollers Championship Event, so it could be a good night to take advantage of smaller fields elsewhere – particularly in the Mega Turbo Satellites and Mega Feeder Satellites (sub-satellites) to Sunday´s Championship Events if you have not already qualified. Tomorrow, there are some very generous guarantee/buy-in ratios for a Friday night, and – on Saturday – it is Ladies Night at Party Poker, with three exclusive events guaranteeing a combined total of $35,000. 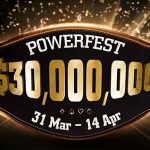 Then it is on to Sunday, with thirty PowerFest tournaments packed into eight hours of action including what we expect to be the most popular event of the series – the $55.00 buy-in PKO Championship Event. Party Poker is supporting its feature tournaments with a fantastic satellite schedule – and it has not gone unnoticed by players. Last night´s $11.00 buy-in satellite guaranteeing twenty-five $109.00 tickets attracted 549 players and paid out double its guaranteed number of prizes. At the same time a $22.00 buy-in satellite for $215.00 tickets paid out twenty prizes more than its guarantee. 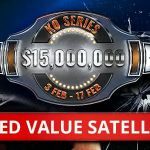 You may find some value in under-subscribed satellites (which tend to guarantee fewer prizes) if you play very early or very late, but as a rule they tend to be very well supported with the exception of satellites feeding into the Ladies events. Obviously Party Poker´s female players have got too much cash to bother with the qualifying process or too little time available due to [insert sexist comment here]. 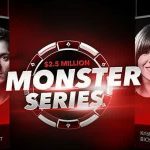 What we have noticed is that, while the satellites to the PowerFest tournaments have been well-supported, the feeders into Party Poker´s $20 million guaranteed MILLIONS Online event have been pretty light on players. That´s understandable considering that the climax to the MILLIONS Online event is more than six months away, but this week could be your best opportunity to book a seat. Although there are only four days to go in the PowerFest series, it is not too late to benefit from a couple of the site´s promotions. 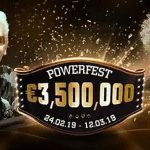 On Friday and Saturday, Party Poker is offering double cashback points on all PowerFest events (not satellites) and there is $120,000 in MILLIONS Online tickets up for grabs in this week´s PowerFest Leaderboard Competition. Because of the way in which PowerFest Leaderboard Points are awarded, you get more points when more players compete in each event. So, although some players will have a three day advantage over you if you start today, there will be considerably more leaderboard points available over the next four days than there have been over the past three days due to this weekend´s feature events. One other promotion you may be able to take advantage of if you have not done so already is the Party Poker first deposit bonus. The 100% bonus on first deposits is available to any new player who creates an account using the Party Poker bonus code “PNREPORT” during the registration process and it could be the gateway to bigger and better things – especially if you are fortunate enough to share in the $12 million climax of Party Poker´s PowerFest Series.